After almost 20 years of working alongside some of Vancouver’s master trades in the high-end residential and commercial sectors, Christian Costo founded Showcase Interiors Ltd. in 2005. 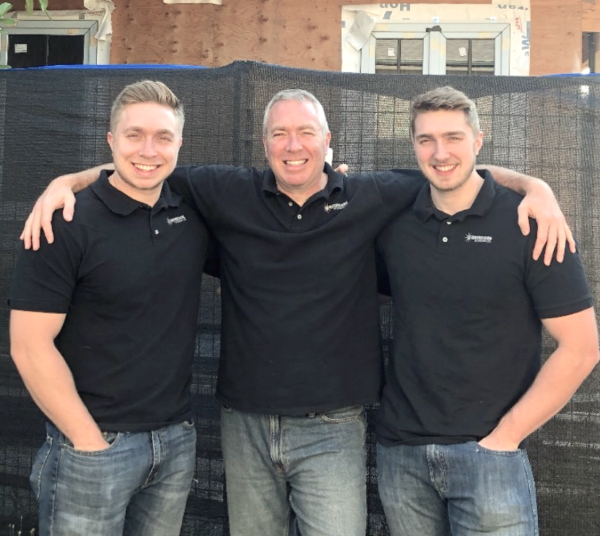 Today, Christian and his sons Marc and Oliver are proud to offer top-tier general contracting services to a wide range of individuals and businesses in Vancouver continuing a long line of trades management history that dates back in the Costo family to 1909. With deep respect for our clients and peers and a focus on craftsmanship, we deliver a premium level construction experience. I would not hesitate to highly recommend Christian Costo of Showcase Interiors Ltd. and his team of highly skilled professionals. Christian has assisted a number of my very good clients and friends with extensive renovations and home improvement projects, each of which were executed on time and on budget. At every turn, Christian and his team ensure the highest calibre of workmanship and flawless client service. I find a strong referral source to be extremely important in my business, as this provides an extension of my complete client service. For interior renovation and improvements, Showcase Interiors is on the top of my list. “Showcase Interiors were meticulous in their execution of our total home renovation. With tight timelines to get us into our home, we were pleasantly surprised at the coordination of the trades and ensuring that we were in for the holidays. Regardless of the trades that were working, they always had someone from their company at the site to ensure integrity of the work and security of our new home. Any follow-ups were dealt with efficiently and promptly. After hearing so many contractor horror stories it was a big under taking for us, but there was no stress and was actually a really fun process. “Christian is a man of great integrity. It was a pleasure to retain Christian and his firm, Showcase Interiors, to undertake a renovation of our recently purchased Yaletown condo. The scope of work entailed replacing hardwood flooring and carpet, installing a new kitchen backsplash, new gas cooktop, additional lighting, detailed metal work, and painting the entire condo. He restored our condo to “better than new condition”. We were very happy with his work. He met the schedule that he had presented to us at the outset. We really appreciated his diligence in providing a detailed cost estimate before he started, and that he did not exceed this estimate. His attention to detail was most impressive, noticing and correcting details that we would never have noticed. His ability to solve any problem, with his great knowledge and innovation, puts him in a league above most. He exercised great management skills, utilized top notch trades, and did an excellent job of coordinating with our concierge staff. “We hired Christian to completely renovate our basement from replacing the plumbing & electrical, to removing the 1970’s wood paneling. He turned our dark, uninviting basement into our new favourite room. He was very detail oriented and was a pleasure to work with. We would definitely recommend Christian. Top Qualities: Great Results, Personable, High Integrity. “Christian was the general contractor for extensive renovations to my apartment. Christian successfully navigated the city approval process, with minimum delays, brought on board excellent sub-trades and worked closely with my designer to create a beautiful design that could actually be built. Christian kept me completely up to date at all times as to the status of the project, explaining the reasons behind delays or design changes in layman’s terms. He was effective in following up with suppliers and sub trades when delays threatened the project and was able to negotiate cost savings in a number of situations. Christian is also one of the most detailed oriented people I have ever met, discovering discrepancies in workmanship that I would likely have never noticed and ensured they were rectified promptly. “I am thrilled with the three renovations Christian Costo and Showcase Interiors Ltd. have done for me. In 2008, Christian and his team of experts transformed my 1991 condo suite into a more functional, current home with cabinet work that was first class in every aspect. No corners were cut to produce quality work. I appreciated and utilized their suggestions how to achieve maximum efficiency in the layout of the rooms. When I moved in 2011, there was no doubt I would call Christian for his ideas and his skilled trade professionals to update my new home. He and his team converted the suite into a clean, modern and functional suite that is a joy to live in. One particular exciting feature that Christian designed and built in both homes was a ceiling cloud over the dining room table, providing modern lighting directly above the table. The cloud and the new crystal chandelier they chose are the highlights of the suite. This year, when I was imagining converting the nook into a much-needed office, I called Christian for his thoughts and ideas how this could be achieved. I never imagined I would be so delighted with the outcome. Removing an inefficient metal file cabinet and installing custom-made file and wall cabinets, and building a spacious desk that does not obstruct the sight-line or the brightness of the room, resulted in the perfect office that is a joy to enter. Showcase Interiors came highly recommended, yet still somehow managed to exceed our expectations. Christian is a pleasure to work in every facet of the project, right from the consultation process through to completion. He delivered on his promise to come in on budget, and did so on time, even throwing in a few unexpected bonuses along the way. The disruption to our home was minimal, and was as functional and tidy as possible at the end of every workday. We really cannot say enough good things about our overall experience, and look forward to working with Christian on any future projects we are able to dream up for him! My husband and I would definitely hire Showcase Interiors Ltd. again. This all turned out to be true. There were many times when in fact, Christian and his team went “above and beyond.” Our project turned out absolutely beautifully. I have omitted descriptive details in the interest of brevity, but would be pleased to provide additional information. Please make your request through Mr. Costo, and I will make myself available for a conversation by phone or email. 5 X Best of Houzz Awards for Service! Read over 30 FIVE STAR Reviews by clicking here. Social Media – See our Daily Posts and Follow Us on Instagram! Copyright © 2019 Showcase Interiors Ltd. All rights reserved.